Clash Royale vs Castle Creeps Battle: Which is Better? Βαθμολόγησε αυτό το Άρθρο Clash Royale and Castle Creeps Battle both bring real-time strategy to your mobile device. Let us compare the two and see who gets the top spot. Mobile has sure changed a lot and Clash Royale has gained quite a bit of a following. It has revolutionized the mobile RTS genre but there are still a couple of things that fans want to change in Clash Royale, either people want things to be added or just simply improved. Now, I have recently discovered a game of a similar genre. I have played Castle Creeps Battle for a few days now and I believe they have good features that Clash Royale doesn’t have. They may have similarities and similar game play but let’s compare the two to see which is better. The basic concept of the game is to defend your base while attacking the enemy. The winner of the match is the one that destroys the opponent’s castle or the player that has the most number of towers destroyed after a set amount of time. Both games have a variety of card to collect and upgrade as you progress on different arenas. And cards require a set amount of elixir to be summoned to the battlefield. And both games battle it out in real-time PVP combat. The two games both have cartoonish designs with a mixture of 3D models and 2D sprites. 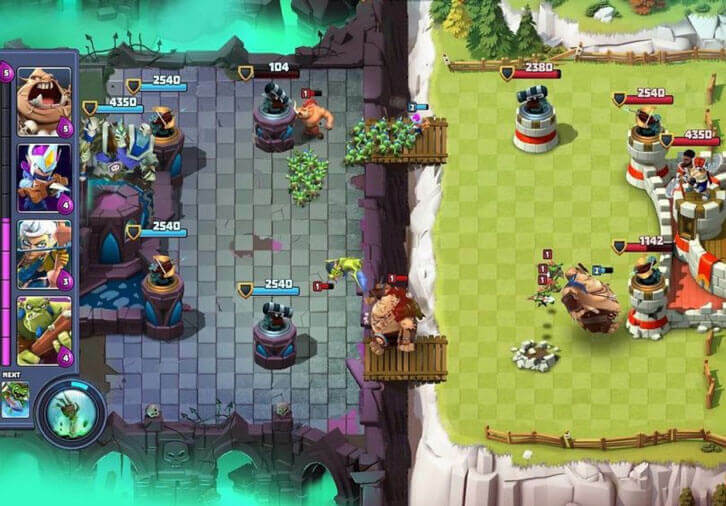 Clash Royale features characters from the developer’s other game, Clash of Clans and Castle Creeps Battle features characters the its developer’s other game, Castle Creeps TD. Clash Royale goes for a more solid albeit generic design while Castle Creeps has a more realistic and vibrant design. Castle Creeps has better graphics in my opinion as it has more defined 3D characters and colorful effects. Castle Creeps Battle has more of a Tower Defense model to its towers as you can take up two different kinds of towers to battle; one type of front tower and one for the back towers. There are different types of towers with different stats and attacks. There are towers that have fast single target attacks, towers with slow splash attacks and many more to unlock. Towers are upgraded by collecting enough cards needed for the upgrades. Clash Royale on the other hand only has the same princess tower available with small damage single target attacks and towers scale together with your level which will go up as soon as you upgrade more cards. Castle Creeps Battle wins this section as they have more tower variety which opens up more diverse strategies. The Clash Royale community has been asking for Heroes to be added to the game for a while now and the developers have released a statement that they have been tinkering with how to implement heroes into the game without messing up with the game’s balance. Castle Creeps Battle wins this round. They currently have 4 different Heroes available, each with different abilities that you can use.